Visitors to the 2015 World Ag Expo will want to stop by Booths 2415-16 in Pavilion B to experience the McCrometer CONNECT TrendView App, which conveniently connects growers and irrigators to their crops anytime/anywhere to help bust the drought and much more. 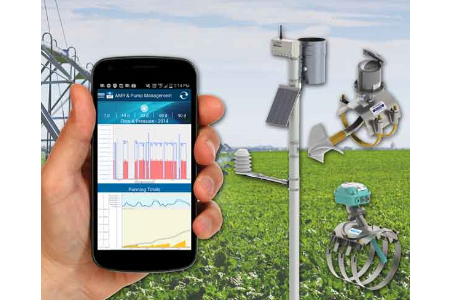 This advanced App provides growers and irrigators with quick, secure access to important crop and irrigation data via smart phone or tablet to make timely decisions that result in effective water management, improved crop quality and yield, as well as reduced labor costs. With 60 years of industry leading expertise, McCrometer provides the full scope of innovative smart ag tools to help beat today’s tough drought conditions. The CONNECT TrendView App is compatible with the suite of McCrometer CONNECT wireless UHF radio and cellular field stations and sensors covering a wide range of monitoring parameters. Available for Android or Apple smartphones and tablets, the app displays soil moisture, evapotranspiration, pump and flow data, as well as weather, disease risk and many other applications. When it comes to water conservation tools, the McCrometer CONNECT system provides dependable wireless weather and soil moisture monitoring, as well as remote meter reading – compatible with McCrometer flow meters including the Mc Propeller, the industry’s most trusted irrigation and agricultural propeller meter, and the Mc Mag3000 battery operated flow meter with a 5+ year battery life. These rugged irrigation management tools help support mandatory metering program compliance, as well as qualify for various government sponsored cost share programs promoting irrigation best management practices. McCrometer’s experts will be available to discuss the latest solutions to farm applications and drought problems. Visitors will learn how McCrometer’s integrated telemetry systems and flow meters can help growers meet today’s ag challenges head on and grow their businesses successfully. McCrometer’s advanced flow measurement solutions solve complex challenges in Agricultural Irrigation, Municipal/Industrial Water & Wastewater, Oil & Gas, Process Control, Electric Power Generation and Institutional Facilities. The company’s products and systems are found in thousands of installations worldwide. Its products and systems meet many of the world’s most demanding industrial, safety and quality standards. For more information, visit www.mccrometer.com.